Overview: With a slew of features such as Wilds, Scatters, Multipliers, Free Spins and a second screen Bonus bonanza, this big 5 reel, 25 pay-line video slot is chock-a-block full of excitement, rewards and wild action! The chief is Wild, and when he helps to build a win combination the reward is doubled. Coyote is a multi-tasker of note, acting as a Scatter which can multiply wins in a combination, but more importantly as a trigger symbol for the outstanding Bonus feature on this free-flowing game. Three Coyotes open up the second screen bonus feature, where players are invited to make selections from five teepees until they hit the teepee hiding the coyote. Each selection has a random ranging reward that can be a credit prize as high as x40 the triggering bet, or up to 10 free spins where the prizes are doubled. This game takes an unusual theme and combines it with a feature-rich gambling game capable of delivering major returns and tons of entertainment. 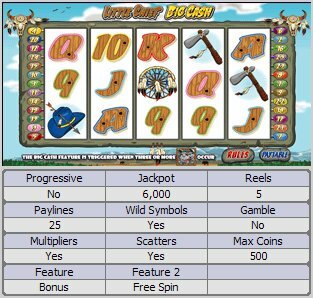 Similar Slots: If you like Little Chief Big Cash, you might like these other 5-reel slot machines: Hot Air, Lifes a Beach, Mad Dash, Mermaids Millions, Reel Baron, Sterling Silver.